A bit of a late post for me, so I will make it a postmortem, i suppose. I started working on The Dark as my first assignment while studying at AIE. 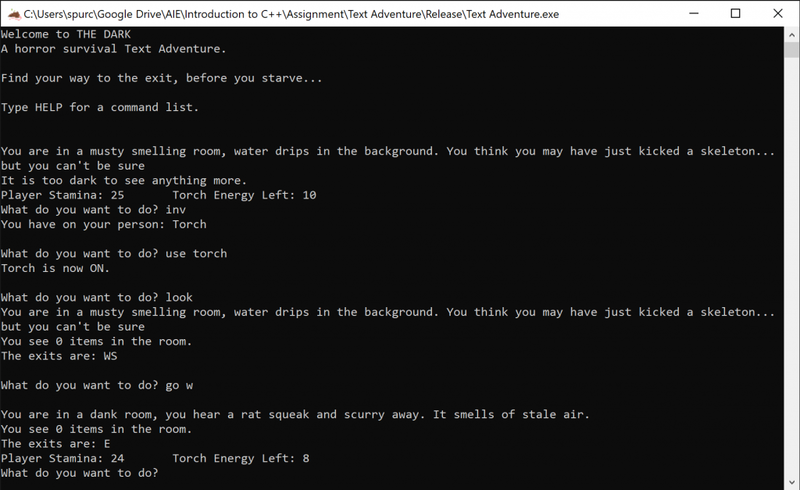 It was to be a text adventure showcasing all of the skills we had mastered over the 6 month duration of the subject, and it was to use our own custom string data type class. The concept of the game is that you are stranded in a dark labyrinth, and must find your way out before you starve. The labyrinth offers only the occasional morsel of food, rare torch batteries, and other throwable objects. You may use your torch to see what is around you, or throw objects that you find in a direction you choose to listen for openings. Looking back, I would admit that I programmed this game quite conservatively, using only the minimum required data types and facets of the C++ language. The most difficult aspect was the random level generator by far. I ran multiple concepts of possible generation styles with pen and paper before settling on the idea of a single winding path with rooms leading out from it. I then created a handful of random room descriptions and Items to place in the rooms, and the game begins! I would like to invite you to give it a try, it’s a simple game but quite challenging.